Yola is the capital city of the Nigerian state of Adamawa. Yola also serves as the administrative capital of the Adamawa state. Yola is often used to refer to both the old town of Yola which is more of a traditional city, but also refers to the new city of Jimeta, which serves as the commercial and administrative center. Yola lies on the banks of the Benue River and is flanked by the Mandara and Shebshi Mountains. Yola is also home to the Gashaka Gumpti Nature Reserve which lie on the border of Cameroon. Yola is served by the Yola Airport (IATA: YOL, ICAO: DNYO). The airport is not the busiest of airports in Nigeria, but it does have it's fair share of air traffic and transported 46,489 passengers in 2007. There are regular scheduled domestic flights to Abuja, Lagos and Maiduguri. The airlines operating there are Arik Air and IRS Airlines. To book the cheapest flights to/from Yola Airport use our handy online booking tool. 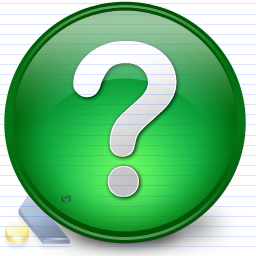 Make sure you compare the price of every airline flying the route or use the booking tool to do a automated comparison. Yola Airport (IATA: YOL, ICAO: DNYO) is not very busy, but there are regular scheduled domestic flights there with carriers Arik Air and IRS Airlines. Yola has many topographical features and is located in a very distinct Geographic region. Yola lies on the banks of the Yola River which is the main tributary to the Niger River. Yola is also close to the Mandara Mountains which lie to the south and the Shebshi Mountains which lie to the North. The Shebshi Mountains, Dimlang (Vogel) Peak, is the second highest point (2,042 m) in Nigeria. Chappal Waddi also known as the "mountain of death" lies in the Gashaka Gumpti Nature Reserve with a access point to the Reserve in Yola. Yola is also where the Mambila Plateau starts it's elevation with it reaching 1828 metres above sea level in some places. The majority of people in Nigeria are involved in farming and agricultural activities. The greater Adamawa State has a Sub-Sudan and Northern Guinea Savannah Zone. Crops like cotton, groundnut are often sold in the markets. For sustenance villagers look to maize, yam, cassava, guinea corn, millet and rice. Villagers located on the banks of the Benue River also engage in fishing with the Fulani people taking part in cattle rearing. From Jimeta/Yola one can catch direct chartered flights to Saudi Arabia. There are taxis that can take you Mubi, Maiduguri, Gombe, Bauchi, Markudi and Katsina. One can also cross the border with taxis to Garoua in Cameroon. There is Yola Airport which operates regular scheduled domestic flights to Abuja, Lagos and Maiduguri. Yola lies close to one of the highest plateaus and escarpments in Nigeria with it having some of the highest mountain ranges in Nigeria. 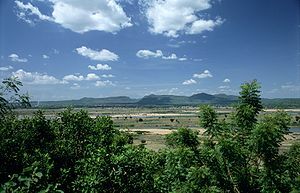 There are the Mandara Mountains which lie to the north of the city, the Shebshi Mountains which lie to the south and hold the title of the second highest point in Nigeria. Generally the area is a mountanous area and if mountains are what you are looking for then you will definitely find them here. The beautiful mountains of the Yola region in Nigeria. Mubi is a village/town not too far from Yola. The village is home to the Nuhu Wakili family which is the ruling family of the town. Previously Yola was a sub-ordinate of the Sultan of Sokoto and thus has it's very own Emir. On your journey to Yola make sure you visit Nuhu Auwalu Wakilis Palace or make a turn at the Emir's palace during the Durbar celebrating Eid-El-Fitri. The Eid Durbar during the year 2011. Sukur, located in the Mandara Mountains, was deemed a World Heritage Site in 1999 due to it being an exceptional landscape that marks a critical stage in human settlement and it's relationship with the environment through it's form of land use. Little to nothing is known about Sukur yet is still one of the many must see wonders of the Yola region. 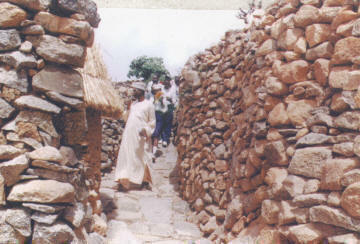 Views of the Sukur cultural landscape. Proudly holding the title of Nigeria's largest Park/Reserve Gashaka Gumpti Park is a definite must-see. 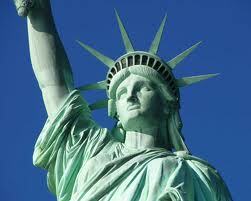 The park is partly located in Cameroon and one walk along the footpaths into Cameroonian territory. The park is divided into two sections, the Gashaka part and the Gumpti part with the Gashaka part being the noticeably larger section. The park has over 360 species of butterfly which account for 90% of Africa's butterflies. 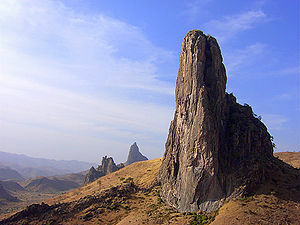 Chappel Wadi, the highest mountain in Nigeria, also lies in the park.